According to the legend (although people will tell you that it’s a true story), Gengis Khan’s elder son, Dzhuchi Khan, conqueror of the steppe and oppressor of the Kyrgyz people, died one day while hunting. 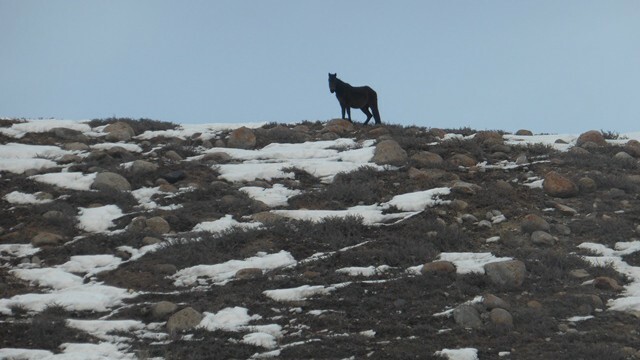 Pursuing a herd of kulans, these wild donkeys from Central Asia, he was hit by the hoofs of the most brave and strong of them, known as the Lame Kulan. Falling down from his horse, Dzhuchi Khan broke his neck and died immediately. Gengis Khan, worrying of not seeing his elder son coming back, ordered his subordinates to find him. But he warned them that if they would come back with a bad news, his anger would be terrible and his sentence without equal : he would fill their throat with melted lead. The miserable subordinates weren’t late finding the lifeless body of Dzhuchi Khan. Scared, reminding their master’s words, they tried to find thousand of different ways to avoid the imperial sentence, in vain. They suddenly heard Ketbuka, the qomuz player, the legendary storyteller and hero of the Kyrgyz people, who had accidentaly witnessed the tragedy and was still hanging around. The coward guards ordered him immediately to bring the news instead of them to Gengis Khan. Ketbuka started to play the saddest melody ever played. By the magic of the qomuz, the scene of the drama reconstituted itself under the eyes of Gengis Khan; he saw his son hunting the herd of kulans, be hit by the hoofs of the Lame Kulan, fell down from his horse, break his neck and die immediately. Then Gengis Khan got terribly angry, and ordered to fill the storyteller’s throat with melted lead. But Ketbuka hadn’t said anything, it was the qomuz who had told the story! Gengis Khan, pensive, finally decided that the qomuz itself would be filled with melted lead. It’s like this that apparead the little hole on the body of the instrument. Once again, thanks to Ketbuka, the qomuz had gained a sound even more beautiful and melodious than before. That is the story of the qomuz, the Kyrgyz people’s emblematic instrument. Made with apricot wood (pierced by the Gengis Khan’s little hole), fitted with three strings and a fretless neck, it’s the instrument of the epic tales and the bard duels. Here is a part of “Aksak Kulan”, Ketbuka’s magic melody. The qomuz is particularly impressive because of the endless inventive positions the musicians are playing with : holding the instrument and playing with the left hand, they realease the right hand and perform big and gracious moves with it, preventing your eyes from understanding what’s going on. Like a crafty illusionist hiding his trick behind tons of wriggles, the qomuz player performs in a way which makes impossible to get where is the music coming from; it’s like if the music would get out of the instrument by itself. It’s really like magic, probably the magic of Ketbuka! The following melody is the melody of the “Fast horse”, performed by two qomuz players, and because the musicians started galloping, i didn’t have the time to take a video. Here is thus an audio recording, way less impressive, but to think you are in the ride, you can imagine the big moves, and when your hear “Hopa!”, you must see the two horse riders throwing their qomuz over their shoulders and play the hand above the head. (The musician on the picture is an other qomuz player i met in Bishkek, but it’s the only picture i have of a qomuz musician showing the famous moves, even though he is here just posing for the photo!). Finally, here is a beautiful song with qomuz, for which i haven’t figured out yet what it is about, but which sounds like happening next to the fire in the yurt instead of on the saddle! Way before Ketbuka faced Gengis Khan’s anger – or maybe was it afterwards, how to know in which direction is the time flowing in the vastness of the steppe – a Kyrgyz hero called Djoloï went to war with his most beautiful horse. Unfortunately (but it had to happen, since it’s a legend), his horse died. To keep an eternal memory of his loyal mount, Djoloï sculpted a piece of abricot tree in his shapes, then fixed on it two strings made out of the hair of his horse. The Kyl Kiyak, other emblematic instrument of the Kyrgyz people, was born. Carved in a single piece of apricot tree and covered with a camel skin, fitted with two strings and a bow in horse hair, the Kyl Kiyak is the instrument of chamanism and ancient Kyrgyz music. Faded from memory during the last century, it was resurrected by the Russians who collected several melodies and made them popular, bringing the instrument back on track. This is the melody Djoloï dedicated to his lost horse. Still nowadays in Kyrgyzstan, when somebody dies, women cry and sing a song based on the melody of Djoloï’s horse. Jew’s harp (“o’oz qomuz” in Kyrgyz), one of the oldest instruments in the world, also belongs to the kyrgyz traditional instruments. Mostly in metal (“temir”), the o’oz qomuz can also be in wood (“jigatch”) like in this recording. Used by the people of Central Asia, China and Mongolia, it’s originally used for chamanic rituals; but the Kyrgyz, those perpetual horse riders, make it the instrument of their epic rides. Back in the time when the Kyrgyz people terrorized the steppe with the only strenght of their horses, the horse trainers were the most important people of the community. This melody is dedicated to those people, thanks to whom the Kyrgyz army had such a reputation in the steppe. But the horse trainers also have their own instrument : the choor, a traditional kyrgyz wind instrument similar to the turkish kaval, played to kill time while the horses are resting in the fields. Instrument of contemplation, its music is mainly inspired by the beauty of Kyrgyz landscapes. Although Nurbek Serkebaev is performing this tune under the grey sky of Bishkek, he confesses to me that imagining the evergreen Kyrgyz mountains helps him to make his music more beautiful! But the true legend of the Kyrgyz people, the epic which concentrates all their history and make this people so proud, is definitely the story of Manas, the famous hero and rallying leader of the Kyrgyz people in their fight for independance. The exploits of Manas, as well as his son’s and his grand son’s ones, are compiled in a corpus of almost half a million verses, the longest epic poem ever written in history. Passed orally from generations to generations over the centuries, the epic of Manas is a colossal collective work of which exists several versions, some of them written during the last century. Learning to recite the Manas doesn’t only provide a better understanding of Kirghiz history, but also teaches to whoever is reciting the noble moral principles which guide the hero and which are still valuable in our today’s society. The Manas storyteller, the Manaschi, is thus a very respected person in the Kyrgyz community, and the tradition is to come to listen to the Manaschi during several cultural events throughout the year. The Manas storytelling goes along with a particular style of acting illustrating the action, sometimes violent when it’s about a battle, or sometimes sad when it’s about a dramatic event; but always in rythm, and when the storytelling takes several hours, even several days, the Manaschi – as well as the subjugated spectator – goes in some kind of trance. I was lucky to attend a short performance of Manas, by the surprising Turgunaaly Zhusup Mamai, grand son of a Great Manaschi able to tell the entirety of the epic, which would usually take seven days in a row, the Manaschi having short breaks from times to times to drink water. Turgunaaly usually tells the Manas for some hours, and he is here offering us a short version of the epic, summing up the main events of the story. Ten minutes may seem to be enough for anybody who don’t speak Kyrgyz, but for the one who understand the language, the storyteller’s art is precisely to submerge the spectator in the heart of the tale, in some kind of epic trance from which he will be able to get out after several hours only, without even realizing how much time just passed! Thanks so much to Zarima Murzabekova fo finding me playing in the snowy streets of Bishkek and for having organized this incredible afternoon with the nice people of the Kochmon’s Youth Social Fund, during which i had the opportunity to record all these sound stories! 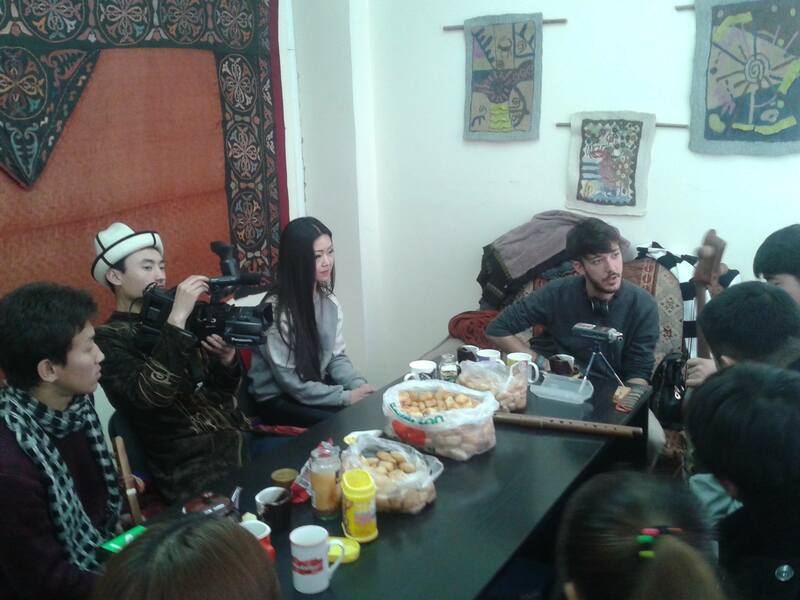 A special thanks to Nurbek Serkebaev – the performer of all the recordings in this article – for his illustrated presentation of all the kyrgyz traditional instruments, and also to Turgunaaly Zhusup Mamai for his amazing demonstration of the Manas storytelling. To go a bit further, here is a wonderful short Kazakh animation (1968) randomly found during my researches on the internet, which is telling in music and images the legend of Ketbuka (activate the subtitles). In this animation Ketbuka is Kazakh and plays the dombra (the Kazakh equivalent of the Kyrgyz qomuz) : the Kazakh and the Kyrgyz are so close to each other historically and culturally that they also share the same legends! This entry was posted in Kyrgyzstan, Uncategorized @en.